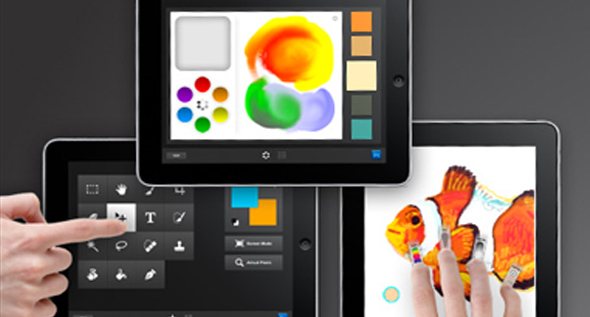 Touch, mobility, and Adobe® Photoshop® CS5 software—how’s that for a creative combination? Adobe and the developer community can now create apps that communicate with Photoshop CS5 via a range of devices and platforms. Explore new Adobe Photoshop Touch apps for iPad, the first to tap into this new connectivity. With Adobe Color Lava, you can use your fingertips to mix colors on your iPad and create custom swatches and five-swatch themes. Instantly access them in Photoshop CS5—all you need is a network connection between your iPad and computer. Or use the app wherever inspiration strikes, and then bring your colors into Photoshop CS5 when you’re connected. Share colors via email, too.